Communities came together on Sunday to celebrate the official reopening of Elland Bridge, the canal and towpath. 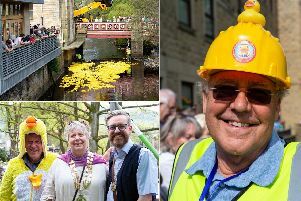 Calderdale Council and the Canal and River Trust, who have been working together to rebuild the bridge and reopen the Calder and Hebble Navigation since the 2015 floods, held the family fun day and to say thank you to the people in Elland. Transport minister Andrew Jones led a ceremony to mark the bridge, canal and towpath returning to full use. Mr Jones said: “It is great to see the reopening of Elland Bridge which reconnects the local community and helps families and businesses return to normal. Boat trips, fairground stalls and entertainment provided by the Hebden Bridge Arts Festival organisers – including face painting, circus acts, magic, stilt walkers and music – were due to be on offer. Councillor Tim Swift, Calderdale Council’s Leader, said: “It was a fantastic event with a real community spirit. “It was great to see so many people of all ages enjoying the wide range of activities, using local businesses and celebrating the official reopening of the bridge, canal and towpath. Work to rebuild the structure after it was damaged in storms in 2015, which has been carried out by Calderdale Council and the Canal & River Trust, has cost £5.5m of Department for Transport flood relief cash. Richard Parry, chief executive of the Canal & River Trust said: “With so many local people and businesses coming together this was not just a celebration of the new bridge but also of Elland and all that it has to offer. Elland’s 1811 bridge was rebuilt, along with nearby Crowther Bridge, . The Grade II listed Elland Bridge had to be completely dismantled when the sheer force of floodwater washed out its foundations on Boxing Day 2015, causing massive structural damage and a huge crack in the road.